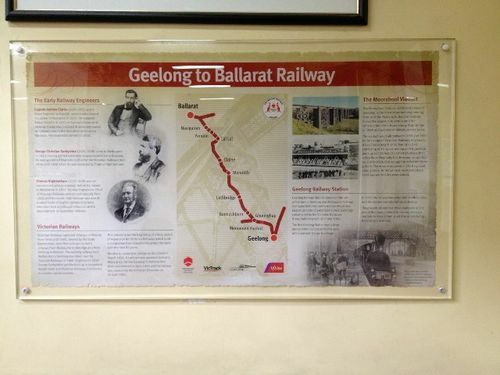 Plaque commemorates the 150th anniversary of the Geelong to Ballarat Rail. The Geelong Ballarat rail line was officially opened on 10th April 1862. This line was built to a high standard by the Victorian Railways, with double track provided throughout, stone station buildings at all of the initial stations, a number of stone bridges for roads that crossed the line, and the 1,450-foot (440 m) Moorabool Viaduct over the river of the same name. This line remained the only way from Ballarat to Melbourne until 1889 when the current direct line was complete.